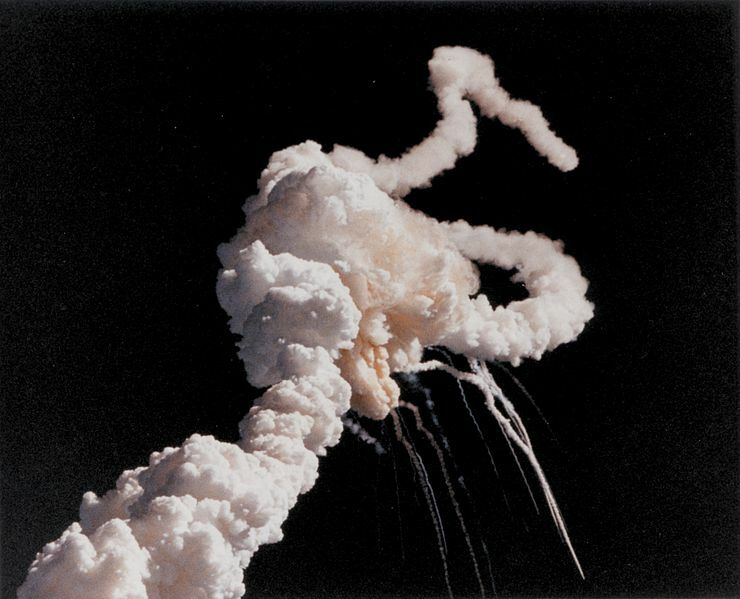 Jan 27, 1986: Engineers try to stop launch of NASA shuttle Challenger, fail. On January 27th engineers working for a NASA subcontractor tried to get the launch of the Challenger Space Shuttle postponed for safety reasons. They were over-ruled. The following day, 7 astronauts died when the vehicle exploded 73 seconds after launch. If we were serious about getting out of this mess, we’d teach this as a case study to primary school students. Following the announcement that the Challenger mission was confirmed for January 28, 1986, Boisjoly and his colleagues tried to stop the flight. Temperatures were due to be down to −1 °C (30 °F) overnight. Boisjoly felt that this would severely compromise the safety of the O-ring, and potentially lose the flight. The matter was discussed with Morton Thiokol managers, who agreed that the issue was serious enough to recommend delaying the flight. They arranged a telephone conference with NASA management and gave their findings. However, after a while, the Morton Thiokol managers asked for a few minutes off the phone to discuss their final position again. Despite the efforts of Boisjoly and others in this off-line briefing, the Morton Thiokol managers decided to advise NASA that their data was inconclusive. NASA asked if there were objections. Hearing none, the decision to fly the ill-fated STS-51L Challenger mission was made. Boisjoly’s concerns proved correct. In the first moments after ignition, the O-rings failed completely and were burned away, resulting in the black puff of smoke visible on films of the launch. This left only a layer of insulating putty to seal the joint. At 59 seconds after launch, buffeted by high-altitude winds, the putty gave way. Hot gases streamed out of the joint in a visible torch-like plume that burned into the external hydrogen tank. At about 73 seconds, the adjacent SRB strut gave way and the vehicle quickly disintegrated. Boisjoly was relieved when the flight lifted off, as his investigations had predicted that the SRB would explode during the initial take-off. However, seventy-three seconds later, he witnessed the shuttle disaster on television. Richard Feynman showing his famous glass-of-water experiment.